If you’re like me you believe you should always have a business card on hand. But if you’re still more like me, the cards you do have sometimes find their way into non-networking MacGyver scenarios ending up bent, scrawled upon or simply depleted. Enter contxts.com. 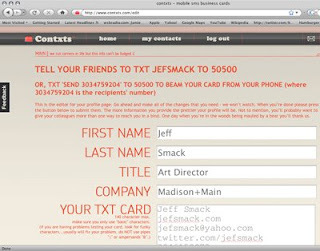 Simply enter your contact info in 140 characters or less and choose a username or codeword and you’re ready to roll. Next time someone hands you a card you reciprocate by having them text your username to 50500 and they are immediately provided a text message with all of your predesignated contact info. If you ever collected sports cards or LPs you’ll likely miss the tangible, nostalgic and aesthetic aspect of cultivating a physical collection of cards. As a designer I love to shape or interpret what a paper business card communicates. My plan is to keep a small stack of cards on hand with the peace of mind that contxts has me covered on the fly.